Robert Brady visited the programme from the University of Cambridge on Tuesday 5 August, to speak on “Why bouncing droplets are a pretty good model for quantum mechanics”. This talk follows up on the talk of Paul Milewski on Friday 1 August. He reviewed the experiments of Yves Couder, and then presented an analysis based more on quantum principles rather than fluid dynamic modelling. The principal equation was a wave equation in the circular dish with a amplitude dependent speed c, emphasizing the role of Lorentz invariance. He pointed out an interesting analogy between the Bjerknes force on bubbles and the analogue in quantum mechanics, including a Bjerknes analogue of Planck’s constant. 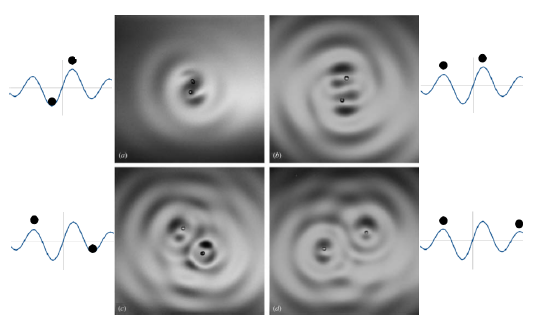 Other quantum phenomena have analogues in this hydrodynamic experiment, such as double-slit diffraction and tunneling. A preprint on this topic, Brady & Anderson (2014), can be found on the arXiv. A related paper, finding quantum phenomena, such as the Aharonov-Bohm effect, in water waves is the paper Berry, Chambers, Large, Upstill & Walmsley (1980). A video of the talk is here.